I have three months left to call Katie my older sister. Then the gap will close and I will pass her. I will get older. But Katie will always be fifteen, eleven months and twenty one days old. Hannah's world is in pieces and she doesn't need the school counselor to tell her she has deep seated psychological issues. With a seriously depressed mum, an injured dad and a dead sister, who wouldn't have problems? It's been twelve long, lonely months since Katie passed away and Hannah still morns her sister each and every day. Her father is physically broken, and her mother is mentally absent, morning for her eldest daughter and no longer functioning. Katie was the elder of the two sisters, the party girl who her peers respected, followed and very much loved. Hannah has always been seen as a social pariah. As Hannah navigated the world of high school and cliques, she'd believed that her childhood best friend would be by her side. But as the popular girls begun to take an interest in recruiting, Hannah found herself alone once more. Invited to parties as nothing more than a cruel joke, taunted, all while older sister Katie looked the other way. Hannah lost Katie long before she died. After Katie had passed, the taunting has stopped but replaced by a forlorn pit. Her parents refuse to communicate beyond the required parental concern, and her only friend is that of her newest in a long line of mental health experts, school counselor Anna. Anna sees that Hannah is struggling with panic attacks and a lack of social interaction, but with the court case and her testimony fast approaching, Hannah begins to retreat within herself once more. Her father claims he can't remember and all Hannah knows is that regardless of what her mother believes, the accident was through no fault of his own. But hope arrives in the guise of Josh, new student, popular and sees that there is more to Hannah than a broken girl in mourning. Despite her best efforts to push Josh away, He won't be swayed, and is determined to get to know the girl that no one else will. Claire Zorn, you are incredible. I absolutely loved Claire's dystopian, The Sky so Heavy and The Protected is absolutely brilliant. The characters are beautifully intricate, well developed with a raw and realistic quality. Claire allows each narrative to deliver their thoughts with a sassy and sarcastic wit, which is not only clever, but allows the reader to relate and invest in her characters through humour. The Protected follows the same premise, but explores the heartbreak of losing a family member, the breakdown of the family unit who are grieving and learning to live again. While my heart ached for Hannah, I absolutely adored Josh. Even though he was aware of Hannah's grief, he never felt the need to console or tread lightly around the discussion of Katie's passing. He was a symbol of hope that Hannah was able to use as her anchor, as well as school counselor Anna. Anna was brilliant. A no nonsense woman who Hannah also felt connection to while her world was caving in. While both parents seemingly struggled to live for the daughter that lived, both were too consumed by grief and guilt to worry how Hannah was fairing. It was an amazing story told in shades of grey, proving that grief is a personal journey to which we all endure individually. 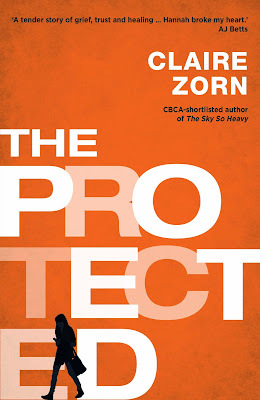 Claire Zorn is one of Australia's young adult authors that all authors should take note of. She can captivate an audience, paint us into her world with characters that stay with us long after the final page is read. I'm sold! Wow, I love the sound of this book and wish I could read it right now. Great review. I hadn't heard of this one, but I have heard of The Sky So Heavy and really want to read that one too. Thanks for sharing. I've read both and my goodness, incredible. She's such an underrated Aussie talent. I don't know of many authors that can successfully write both contemporaries and a phenomenal post apocalyptic that will both engage readers. I'm such a fan of her work. I hadn't heard of this one before but now I want it really badly. It sounds incredible. I have a thing for sister relationships seeing as I have a much younger sister, and the bond we share is so unique. I'm curious to read more about grief too, and I'm glad this is an impactful read! Thanks for the awesome review! It's brilliant. First and foremost, Hannah is incredibly engaging and real. She could be your friend, sister, or next door neighbour, she's really likable as well. I think that's a big part of this one having such an incredible impact, the ability to relate to the characters. Claire also has a sassy style of writing that really makes it a complete pleasure to read. I'M SOLD TOO. I was reading this and wracking my poor little brain because I swear I've heard the author's name before but I'm sure I haven't ever read anything by her....buuut, I'm pretty sure Emily just reviewed The Sky So Heavy. STAHP it peoples. I DON'T NEED MORE BOOKS ON MY TBR. Both books are incredibly different, but both incredible! There's just something so real about the emotion of Hannah's situation. You'll love this one, I can almost guarantee it. I'm pretty interested in seeing what I feel about this, especially after reading your review- I don't really think it's the sort of book I would enjoy, but I do have a copy and can only hope I find some of the wonderful aspects in it that you clearly enjoyed so much. Your review actually does intrigue me about the story quite a bit, so I'm definitely going to remember it when I start reading! There's something about Claire Zorn's writing style that draws me in. She's not one of those authors to overdramtise or use flowery descriptions to lure you in. It's clean and edgy with a touch of sass and snark. I'd read her shopping list at this point.